This article is about the complete fire protection system. For the device that actually discharges water, see Fire sprinkler. A glass bulb type sprinkler head will spray water into the room if sufficient heat reaches the bulb and causes it to shatter. Sprinkler heads operate individually. Note the red liquid alcohol in the glass bulb. A fire sprinkler system is an active fire protection method, consisting of a water supply system, providing adequate pressure and flowrate to a water distribution piping system, onto which fire sprinklers are connected. Although historically only used in factories and large commercial buildings, systems for homes and small buildings are now available at a cost-effective price. Fire sprinkler systems are extensively used worldwide, with over 40 million sprinkler heads fitted each year. In buildings completely protected by fire sprinkler systems, over 96% of fires were controlled by fire sprinklers alone. Leonardo da Vinci designed a sprinkler system in the 15th century. Leonardo automated his patron's kitchen with a super-oven and a system of conveyor belts. In a comedy of errors, everything went wrong during a huge banquet, and a fire broke out. "The sprinkler system worked all too well, causing a flood that washed away all the food and a good part of the kitchen." Ambrose Godfrey created the first successful automated sprinkler system in 1723. He used gunpowder to release a tank of extinguishing fluid. The world's first modern recognizable sprinkler system was installed in the Theatre Royal, Drury Lane in the United Kingdom in 1812 by its architect, William Congreve, and was covered by patent No. 3606 dated the same year. The apparatus consisted of a cylindrical airtight reservoir of 400 hogsheads (c. 95,000 litres) fed by a 10-inch (250 mm) water main which branched to all parts of the theatre. A series of smaller pipes fed from the distribution pipe were pierced with a series of 1⁄2-inch (13 mm) holes which pour water in the event of a fire. From 1852 to 1885, perforated pipe systems were used in textile mills throughout New England as a means of fire protection. However, they were not automatic systems, they did not turn on by themselves. Inventors first began experimenting with automatic sprinklers around 1860. The first automatic sprinkler system was patented by Philip W. Pratt of Abington, MA, in 1872. Henry S. Parmalee of New Haven, Connecticut is considered the inventor of the first practical automatic sprinkler head. Parmalee improved upon the Pratt patent and created a better sprinkler system. In 1874, he installed his fire sprinkler system into the piano factory that he owned. Frederick Grinnell improved Parmalee's design and in 1881 patented the automatic sprinkler that bears his name. He continued to improve the device and in 1890 invented the glass disc sprinkler, essentially the same as that in use today. Building regulations in Scotland and England require fire sprinkler systems to be installed in certain types of properties to ensure safety of occupants. In Scotland, all new schools are sprinkler protected, as are new care homes, sheltered housing and high rise flats. In England all high rise buildings over 30 m must have sprinkler protection. In 2011 Wales became the first country in the world to make installation of fire sprinklers in new homes mandatory. The law applies to newly built houses and blocks of flats, as well as care homes and university halls of residence. This law came into force on September 2013. Sprinklers have been in use in the United States since 1874, and were used in factory applications where fires at the turn of the century were often catastrophic in terms of both human and property losses. In the US, sprinklers are today required in all new high rise and underground buildings generally 75 feet (23 m) above or below fire department access, where the ability of firefighters to provide adequate hose streams to fires is limited. Sprinklers may be required to be installed by building codes, or may be recommended by insurance companies to reduce potential property losses or business interruption. Building codes in the United States for places of assembly, generally over 100 persons, and places with overnight sleeping accommodation such as hotels, nursing homes, dormitories, and hospitals usually require sprinklers either under local building codes, as a condition of receiving State and Federal funding or as a requirement to obtain certification (essential for institutions who wish to train medical staff). In 1990 the US Congress passed PL-101-391, better known as the Hotel and Motel Fire Safety Act of 1990. This law requires that any hotel, meeting hall, or similar institution that receives federal funds (i.e. for a government traveller's overnight stay, or a conference, etc. ), must meet fire and other safety requirements. The most visible of these conditions is the implementation of sprinklers. As more and more hotels and other public accommodations upgraded their facilities to enable acceptance of government visitors, this type of construction became the de facto industry norm – even when not directly mandated by any local building codes. If building codes do not explicitly mandate the use of fire sprinklers, the code often makes it highly advantageous to install them as an optional system. Most US building codes allow for less expensive construction materials, larger floor area limitations, longer egress paths, and fewer requirements for fire rated construction in structures protected by fire sprinklers. Consequently, the total building cost is often decreased by installing a sprinkler system and saving money in the other aspects of the project, as compared to building a non-sprinklered structure. In 2011, Pennsylvania and California became the first US states to require sprinkler systems in all new residential construction. However, Pennsylvania repealed the law later that same year. Many municipalities now require residential sprinklers, even if they are not required at the state level. Renewed interest in and support for sprinkler systems in the UK has resulted in sprinkler systems being more widely installed. In schools, for example, the government has issued recommendations through Building Bulletin 100 that most new schools should be constructed with sprinkler protection. In 2011 Wales became the first country in the world where sprinklers are compulsory in all new homes. The law applies to newly built houses and blocks of flats, as well as care homes and university halls of residence. In Scotland, all new schools are sprinklered, as are new care homes, sheltered housing and high rise flats. In the UK, since the 1990s sprinklers have gained recognition within the Building Regulations (England and Wales) and Scottish Building Standards and under certain circumstances, the presence of sprinkler systems is deemed to provide a form of alternative compliance to some parts of the codes. For example, the presence of a sprinkler system will usually permit doubling of compartment sizes and increases in travel distances (to fire exits) as well as allowing a reduction in the fire rating of internal compartment walls. In Norway as of July 2010, all new housing of more than two storeys, all new hotels, care homes and hospitals must be sprinklered. Other Nordic countries require or soon will require sprinklers in new care homes, and in Finland as of 2010 a third of care homes were retrofitted with sprinklers. A fire in an illegal immigrant detention center at Schiphol airport in The Netherlands on 27 October 2005 killed 11 detainees and led to the retrofitting of sprinklers in all similarly designed prisons in the Netherlands. A fire at Düsseldorf Airport on 11 April 1996 which killed 17 people led to sprinklers being retrofitted in all major German airports. Most European countries also require sprinklers in shopping centers, in large warehouses and in high-rise buildings. Each closed-head sprinkler is held closed by either a heat-sensitive glass bulb or a two-part metal link held together with fusible alloy. The glass bulb or link applies pressure to a pipe cap which acts as a plug which prevents water from flowing until the ambient temperature around the sprinkler reaches the design activation temperature of the individual sprinkler head. In a standard wet-pipe sprinkler system, each sprinkler activates independently when the predetermined heat level is reached. Thus, only sprinklers near the fire will operate, normally just one or two. This maximizes water pressure over the point of fire origin, and minimizes water damage to the building. A sprinkler activation will do less water damage than a fire department hose stream, which provide approximately 900 litres/min (250 US gallons/min). A typical sprinkler used for industrial manufacturing occupancies discharge about 75-150 litres/min (20-40 US gallons/min). However, a typical Early Suppression Fast Response (ESFR) sprinkler at a pressure of 50 psi (340 kPa) will discharge approximately 380 litres per minute (100 US gal/min). In addition, a sprinkler will usually activate within one to four minutes of the fire's start, whereas it typically takes at least five minutes for a fire department to register an alarm and drive to the fire site, and an additional ten minutes to set up equipment and apply hose streams to the fire. This additional time can result in a much larger fire, requiring much more water to extinguish. Fire sprinkler control valve assembly. By a wide margin, wet pipe sprinkler systems are installed more often than all other types of fire sprinkler systems. They also are the most reliable, because they are simple, with the only operating components being the automatic sprinklers and (commonly, but not always) the automatic alarm check valve. An automatic water supply provides water under pressure to the system piping. Wet systems may be charged with an antifreeze chemical, for use where pipes can't reliably be kept above 40 degrees Fahrenheit. While such systems were once common in cold areas, after several fires caused by systems running too high a percentage of antifreeze, the regulatory authority in the United States effectively banned new antifreeze installations. A sunset date of 2022 applies to older antifreeze systems in the USA . This regulatory action has greatly increased costs and reduced options for cold weather sprinkler systems. Dry pipe systems are the second most common sprinkler system type. Dry pipe systems are installed in spaces in which the ambient temperature may be cold enough to freeze the water in a wet pipe system, rendering the system inoperable. Dry pipe systems are most often used in unheated buildings, in parking garages, in outside canopies attached to heated buildings (in which a wet pipe system would be provided), or in refrigerated coolers. In regions using NFPA regulations, wet pipe systems cannot be installed unless the range of ambient temperatures remains above 40 °F (4 °C). Water is not present in the piping until the system operates; instead, the piping is filled with air at a pressure below the water supply pressure. To prevent the larger water supply pressure from prematurely forcing water into the piping, the design of the dry pipe valve (a specialized type of check valve) results in a greater force on top of the check valve clapper by the use of a larger valve clapper area exposed to the piping air pressure, as compared to the higher water pressure but smaller clapper surface area. When one or more of the automatic sprinkler heads is triggered, it opens allowing the air in the piping to vent from that sprinkler. Each sprinkler operates independently, as its temperature rises above its triggering threshold. As the air pressure in the piping drops, the pressure differential across the dry pipe valve changes, allowing water to enter the piping system. Water flow from sprinklers, needed to control the fire, is delayed until the air is vented from the sprinklers. In regions using NFPA 13 regulations, the time it takes water to reach the hydraulically remote sprinkler from the time that sprinkler is activated is limited to a maximum of 60 seconds. In industry practice, this is known as the "Maximum Time of Water Delivery". The maximum time of water delivery may be required to be reduced, depending on the hazard classification of the area protected by the sprinkler system. Some property owners and building occupants may view dry pipe sprinklers as advantageous for protection of valuable collections and other water sensitive areas. This perceived benefit is due to a fear that wet system piping may slowly leak water without attracting notice, while dry pipe systems may not fail in this manner. If the sprinklers share the same standpipe system as the standpipe system which supplies fire hoses, then the water supply to the fire hoses would be severely reduced or even curtailed altogether. Increased complexity: Dry pipe systems require additional control equipment and air pressure supply components which increases system complexity. This puts a premium on proper maintenance, as this increase in system complexity results in an inherently less reliable overall system (i.e. more single failure points) as compared to a wet pipe system. Higher installation and maintenance costs: The added complexity impacts the overall dry-pipe installation cost, and increases maintenance expenditure primarily due to added service labor costs. Lower design flexibility: Regulatory requirements limit the maximum permitted size (i.e. 750 gallons) of individual dry-pipe systems, unless additional components and design efforts are provided to limit the time from sprinkler activation to water discharge to under one minute. These limitations may increase the number of individual sprinkler zones (i.e. served from a single riser) that must be provided in the building, and impact the ability of an owner to make system additions. Increased fire response time: Because the piping is empty at the time the sprinkler operates, there is an inherent time delay in delivering water to the sprinklers which have operated while the water travels from the riser to the sprinkler, partially filling the piping in the process. A maximum of 60 seconds is normally allowed by regulatory requirements from the time a single sprinkler opens until water is discharged onto the fire. This delay in fire suppression results in a larger fire prior to control, increasing property damage. Increased corrosion potential: Following operation or testing, dry-pipe sprinkler system piping is drained, but residual water collects in piping low spots, and moisture is also retained in the atmosphere within the piping. This moisture, coupled with the oxygen available in the compressed air in the piping, increases internal pipe corrosion, eventually leading to pin-hole leaks or other piping failures. 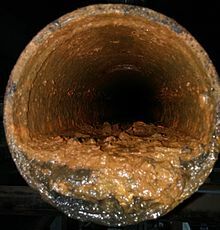 The internal corrosion rate in wet pipe systems (in which the piping is constantly full of water) is much lower, as the amount of oxygen available for the corrosion process is lower. Corrosion can be combated by using copper or stainless steel pipe which is less susceptible to corrosion, or by using dry nitrogen gas to pressurize the system, rather than air. Nitrogen generators can be used as a permanent source of nitrogen gas, which is beneficial because dry pipe sprinkler systems require an uninterrupted supply of supervisory gas. These additional precautions can increase the up-front cost of the system, but will help prevent system failure, increased maintenance costs, and premature need for system replacement in the future. "Deluge" systems are systems in which all sprinklers connected to the water piping system are open, in that the heat sensing operating element is removed, or specifically designed as such. These systems are used for special hazards where rapid fire spread is a concern, as they provide a simultaneous application of water over the entire hazard. They are sometimes installed in personnel egress paths or building openings to slow travel of fire (e.g. openings in a fire-rated wall). Water is not present in the piping until the system operates. Because the sprinkler orifices are open, the piping is at atmospheric pressure. To prevent the water supply pressure from forcing water into the piping, a "deluge valve" is used in the water supply connection, which is a mechanically latched valve. It is a non-resetting valve, and stays open once tripped. Because the heat sensing elements present in the automatic sprinklers have been removed (resulting in open sprinklers), the deluge valve must be opened as signaled by a fire alarm system. The type of fire alarm initiating device is selected mainly based on the hazard (e.g. pilot sprinklers, smoke detectors, heat detectors, or optical flame detectors). The initiation device signals the fire alarm panel, which in turn signals the deluge valve to open. Activation can also be manual, depending on the system goals. Manual activation is usually via an electric or pneumatic fire alarm pull station, which signals the fire alarm panel, which in turn signals the deluge valve to open. Operation - Activation of a fire alarm initiating device, or a manual pull station, signals the fire alarm panel, which in turn signals the deluge valve to open, allowing water to enter the piping system. Water flows from all sprinklers simultaneously. Pre-action sprinkler systems are specialized for use in locations where accidental activation is especially undesirable, such as in museums with rare art works, manuscripts, or books; and data centers, for protection of computer equipment from accidental water discharge. Pre-action systems are hybrids of wet, dry, and deluge systems, depending on the exact system goal. There are two main sub-types of pre-action systems: single interlock, and double interlock. 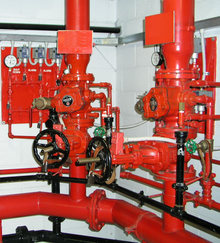 The operation of single interlock systems are similar to dry systems except that these systems require that a "preceding" fire detection event, typically the activation of a heat or smoke detector, takes place prior to the "action" of water introduction into the system's piping by opening the pre-action valve, which is a mechanically latched valve (i.e. similar to a deluge valve). In this way, the system is essentially converted from a dry system into a wet system. The intent is to reduce the undesirable time delay of water delivery to sprinklers that is inherent in dry systems. Prior to fire detection, if the sprinkler operates, or the piping system develops a leak, loss of air pressure in the piping will activate a trouble alarm. In this case, the pre-action valve will not open due to loss of supervisory pressure, and water will not enter the piping. The operation of double interlock systems are similar to deluge systems except that automatic sprinklers are used. These systems require that both a "preceding" fire detection event, typically the activation of a heat or smoke detector, and an automatic sprinkler operation take place prior to the "action" of water introduction into the system's piping. Activation of either the fire detectors alone, or sprinklers alone, without the concurrent operation of the other, will not allow water to enter the piping. Because water does not enter the piping until a sprinkler operates, double interlock systems are considered as dry systems in terms of water delivery times, and similarly require a larger design area. "Water spray" systems are operationally identical to a deluge system, but the piping and discharge nozzle spray patterns are designed to protect a uniquely configured hazard, usually being three-dimensional components or equipment (i.e. as opposed to a deluge system, which is designed to cover the horizontal floor area of a room). The nozzles used may not be listed fire sprinklers, and are usually selected for a specific spray pattern to conform to the three-dimensional nature of the hazard (e.g. typical spray patterns being oval, fan, full circle, narrow jet). Examples of hazards protected by water spray systems are electrical transformers containing oil for cooling or turbo-generator bearings. Water spray systems can also be used externally on the surfaces of tanks containing flammable liquids or gases (such as hydrogen). Here the water spray is intended to cool the tank and its contents to prevent tank rupture/explosion (BLEVE) and fire spread. Water mist systems are used for special applications in which it is decided that creating a heat absorbent vapor is the primary objective. This type of system is typically used where water damage may be a concern, or where water supplies are limited. NFPA 750 defines water mist as a water spray with a droplet size of "less than 1000 microns at the minimum operation pressure of the discharge nozzle." The droplet size can be controlled by the adjusting discharge pressure through a nozzle of a fixed orifice size. By creating a mist, an equal volume of water will create a larger total surface area exposed to the fire. The larger total surface area better facilitates the transfer of heat, thus allowing more water droplets to turn to steam more quickly. A water mist, which absorbs more heat than water per unit time, due to exposed surface area, will more effectively cool the room, thus reducing the temperature of the flame. Operation - Water mist systems can operate with the same functionality as deluge, wet pipe, dry pipe, or pre-action systems. The difference is that a water mist system uses a compressed gas as an atomizing medium, which is pumped through the sprinkler pipe. Instead of compressed gas, some systems use a high-pressure pump to pressurize the water so it atomizes as it exits the sprinkler nozzle. Systems can be applied using local application method or total flooding method, similar to Clean Agent Fire Protection Systems. Sprinkler systems are intended to either control the fire or to suppress the fire. Control mode sprinklers are intended to control the heat release rate of the fire to prevent building structure collapse, and pre-wet the surrounding combustibles to prevent fire spread. The fire is not extinguished until the burning combustibles are exhausted or manual extinguishment is effected by firefighters. Suppression mode sprinklers (formerly known as Early Suppression Fast Response (ESFR) sprinklers) are intended to result in a severe sudden reduction of the heat release rate of the fire, followed quickly by complete extinguishment, prior to manual intervention. Most sprinkler systems installed today are designed using an area and density approach. First the building use and building contents are analyzed to determine the level of fire hazard. Usually buildings are classified as light hazard, ordinary hazard group 1, ordinary hazard group 2, extra hazard group 1, or extra hazard group 2. After determining the hazard classification, a design area and density can be determined by referencing tables in the National Fire Protection Association (NFPA) standards. The design area is a theoretical area of the building representing the worst case area where a fire could burn. The design density is a measurement of how much water per square foot of floor area should be applied to the design area. For example, in an office building classified as light hazard, a typical design area would be 1,500 square feet (140 m2) and the design density would be 0.1 US gallons per minute (0.38 l/min) per 1 square foot (0.093 m2) or a minimum of 150 US gallons per minute (570 l/min) applied over the 1,500-square-foot (140 m2) design area. Another example would be a manufacturing facility classified as ordinary hazard group 2 where a typical design area would be 1,500 square feet (140 m2) and the design density would be 0.2 US gallons per minute (0.76 l/min) per 1 square foot (0.093 m2) or a minimum of 300 US gallons per minute (1,100 l/min) applied over the 1,500-square-foot (140 m2) design area. After the design area and density have been determined, calculations are performed to prove that the system can deliver the required amount of water over the required design area. These calculations account for all of the pressure that is lost or gained between the water supply source and the sprinklers that would operate in the design area. This includes pressure losses due to friction inside the piping and losses or gains due to elevational differences between the source and the discharging sprinklers. Sometimes momentum pressure from water velocity inside the piping is also calculated. Typically these calculations are performed using computer software but before the advent of computer systems these sometimes complicated calculations were performed by hand. This skill of calculating sprinkler systems by hand is still required training for a sprinkler system design technologist who seeks senior level certification from engineering certification organizations such as the National Institute for Certification in Engineering Technologies (NICET). Sprinkler systems in residential structures are becoming more common as the cost of such systems becomes more practical and the benefits become more obvious. Residential sprinkler systems usually fall under a residential classification separate from the commercial classifications mentioned above. A commercial sprinkler system is designed to protect the structure and the occupants from a fire. Most residential sprinkler systems are primarily designed to suppress a fire in such a way to allow for the safe escape of the building occupants. While these systems will often also protect the structure from major fire damage, this is a secondary consideration. In residential structures sprinklers are often omitted from closets, bathrooms, balconies, garages and attics because a fire in these areas would not usually impact the occupant's escape route. If water damage or water volume is of particular concern, a technique called Water Mist Fire Suppression may be an alternative. This technology has been under development for over 50 years. It hasn't entered general use, but is gaining some acceptance on ships and in a few residential applications. Mist suppression systems work by using the heat of the fire to 'flash' the water mist cloud to steam. This then smothers the fire. As such, mist systems tend to be highly effective where there is likely to be a free-burning hot fire. Where there is insufficient heat (as in a deep seated fire such as will be found in stored paper) no steam will be generated and the mist system will not extinguish the fire. Some tests have shown that the volume of water needed to extinguish a fire with such a system installed can be dramatically less than with a conventional sprinkler system. In 2008, the installed costs of sprinkler systems ranged from US$0.31 – $3.66 per square foot, depending on type and location. Residential systems, installed at the time of initial home construction and utilizing municipal water supplies, average about US$0.35/square foot. Systems can be installed during construction or retrofitted. Some communities have laws requiring residential sprinkler systems, especially where large municipal hydrant water supplies ("fire flows") are not available. Nationwide in the United States, one and two-family homes generally do not require fire sprinkler systems, although the overwhelming loss of life due to fires occurs in these spaces. Residential sprinkler systems are inexpensive (about the same per square foot as carpeting or floor tiling), but require larger water supply piping than is normally installed in homes, so retrofitting is usually cost prohibitive. 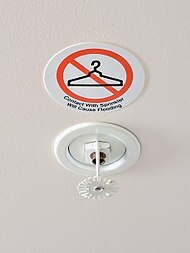 According to the National Fire Protection Association (NFPA), fires in hotels with sprinklers averaged 78% less damage than fires in hotels without them (1983–1987). The NFPA says the average loss per fire in buildings with sprinklers was $2,300, compared to an average loss of $10,300 in unsprinklered buildings. The NFPA adds that there is no record of a fatality in a fully sprinklered building outside the point of fire origin. However, in a purely economic comparison, this is not a complete picture; the total costs of fitting, and the costs arising from non-fire triggered release must be factored. The NFPA states that it "has no record of a fire killing more than two people in a completely sprinklered building where a sprinkler system was properly operating, except in an explosion or flash fire or where industrial fire brigade members or employees were killed during fire suppression operations." The world's largest fire sprinkler manufacturer is the Fire Protection Products division of Tyco International. ^ "Industrial Fire sprinklers". Fire Safety Advice Centre. Archived from the original on 16 January 2013. Retrieved 6 February 2013. ^ Hall, John R. Jr. (June 2013). "US Experience with Sprinklers". NFPA. Archived from the original on 12 March 2016. Retrieved 15 March 2016. ^ a b "History of Sprinkler Systems". Associated Fire Protection. ^ Wormald, John (December 1923). "History Automatic Fire Sprinklers". Olyfire.com. Archived from the original on 2 November 2012. Retrieved 8 February 2013. ^ a b c Merit Sprinkler Company. "Sprinkler History". Archived from the original on 11 August 2006. Retrieved 11 August 2006. ^ "History of Fire Sprinkler Systems". Archived from the original on 14 March 2015. ^ Wotapka, Dawn (22 December 2010). "Builders Smokin' Mad Over New Sprinkler Rules". The Wall Street Journal. Archived from the original on 2 September 2017. ^ "Pennsylvania repeals automatic sprinkler requirement". Archived from the original on 11 July 2015. Retrieved 8 July 2015. ^ "Sprinkler requirements by state". Archived from the original on 10 July 2015. Retrieved 8 July 2015. ^ "Fire sprinklers compulsory for all new homes in Wales". BBC News. 16 February 2011. Archived from the original on 5 August 2011. Retrieved 4 August 2011. ^ "Welsh History of Sprinklers". Archived from the original on 14 March 2015. ^ "Water Damage & Restoration Planning". Property Damage restoration & moisture Division. 19 October 2009. Archived from the original on 23 December 2014. ^ [www.nortechsystems.com/2018/03/16/antifreeze-fire-sprinkler-system/ "The End of Antifreeze in Fire Sprinkler Systems"] Check |url= value (help). Fire Safety Advice Centre. Retrieved 29 November 2018. ^ "CORROSION IN AUTOMATIC SPRINKLER SYSTEMS". FM Global Property Loss Prevention Data Sheet. 2–1. 2016. Archived from the original on 16 November 2016. ^ "Pump units". Hi-Fog. Archived from the original on 1 February 2013. Retrieved 6 February 2013. ^ "FRONT MATTER - Fire Suppression Substitutes and Alternatives to Halon for U.S. Navy Applications - The National Academies Press". doi:10.17226/5744. Archived from the original on 22 January 2015. Wikimedia Commons has media related to Fire sprinkler.